I wanted to have a look inside the fuel tank and check there wasn't any rust blocking up the sender filter which could be causing fuel starvation leading to the misfire issue. 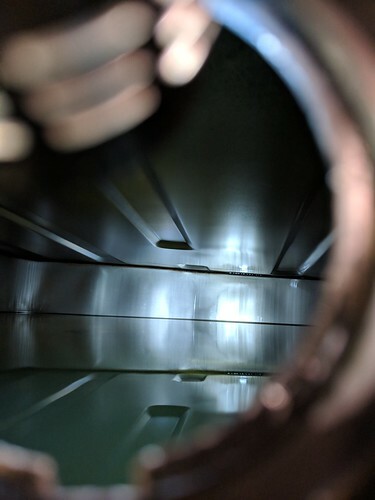 The sender is secured to the tank with a collar which sits around the sender plate and is then rotated to slot under lugs around the opening on the tank face. This presses on a rubber seal to make it airtight. As the opening is about halfway down the tank I siphoned off as much fuel as I could before removing the wheel and raising that corner of the car to push the remaining fuel away from the opening. The old collar was very tight and took a good amount of persuasion to remove but once off the tank looked absolutely clear with no rust showing anywhere. Similarly the sender and filter were also very clean, so I can rule this out as an issue.